Before we begin our overview of today's most popular 3D-printing technologies, it is important to understand how the majority of 3D printers work. If you have a model that you’d like to 3D print, you need a CAD file, which contains essential information about the object’s dimensions. However, 3D printers cannot read CAD files so they must be translated into a code that the 3D printer can understand. Standard Tessellation Language, or STL, is the language type most commonly used for the purpose of interpreting CAD files. The STL divides up the layers of the CAD and sends the information to the 3D printer. From there, each 3D printer does its own thing depending on the technology at its core. 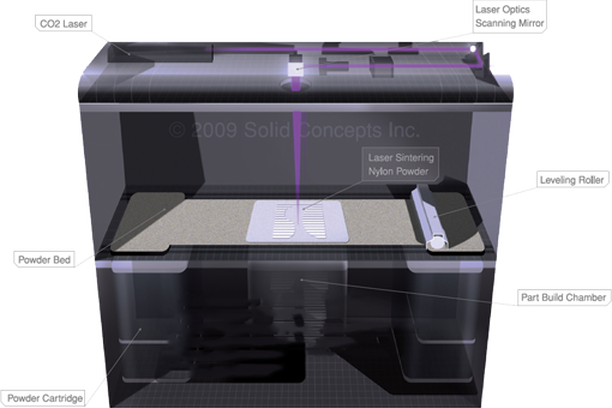 Stereolithography (SLA) transforms liquid plastic (resin) into solid objects, one layer at a time, using an ultraviolet laser. After each layer, the print bed lowers and a new layer of resin is added until the part is finished. When a part is complete, it is cleaned in a solvent solution to remove any remaining wet resin. It then is exposed to UV light to complete the curing process. SLA is well recognized for its precision, accuracy and quality, which is why it is often used for rapid prototyping and modelling purposes. 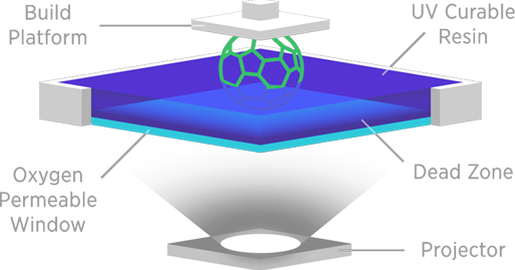 With SLA, material costs can be kept low, as leftover resin can be used for future 3D-printing projects. 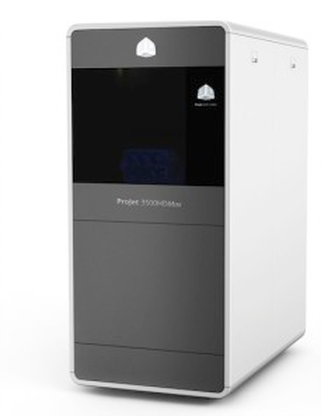 Stereolithography also offers the smoothest surface finish of all the additive manufacturing processes. Parts made using SLA require support structures as well as more post-processing, although this gives you additional freedom and the ability to choose various finishes (e.g. electroplating your parts with metal to increase durability and/or electrical conductivity). CLIP is a chemical process that carefully balances light and oxygen to grows parts from a resin tank rather than building them layer by layer. It is able to achieve impressive speed and quality by harnessing light (which triggers photopolymerization) and oxygen (which inhibits it). 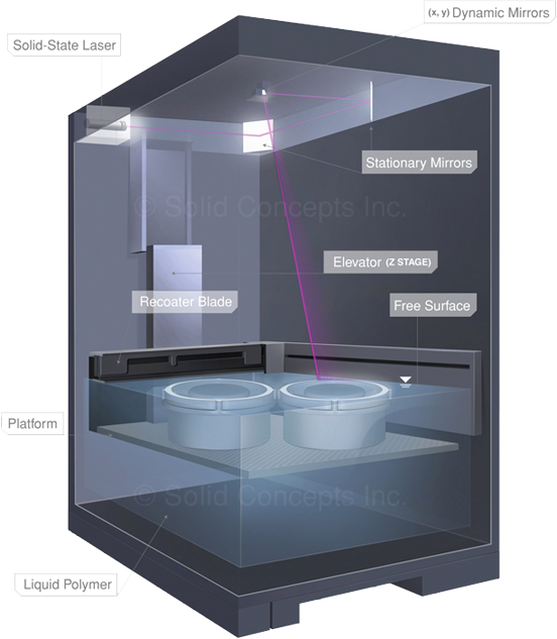 projecting light through an oxygen-permeable window into a reservoir of UV curable resin. The build platform lifts continuously as the object is grown. Currently, the only company offering the unique CLIP technology is Carbon3D. Fused deposition modeling (FDM) builds objects one layer at a time from the bottom up, using thermoplastic filament. During the printing process, the material is deposited in layers to create a 3D-printed object.FDM printers use two kinds of materials: (1) a modeling material (which is what the final object will be made of), and (2) a support material (to be used, if necessary, as a scaffold to keep the object in place during the printing process). During the printing process, the 3D printer filament is wound up into a coil and fed through a nozzle. This nozzle melts the material and extrudes into onto the print bed, where it hardens immediately. The nozzle, controlled by a computer, moves as directed by the CAD file. The FDM system first creates a cross section of the object onto the print bed; as each layer is completed, the platform lowers to make way for the next layer of filament until the object is completed. FDM 3D printing is one of the most widely used forms of 3D printing, especially for home and hobby uses, because desktop versions are often the most affordable. Objects created using FDM manufacturing are also often used for modelling, prototyping and mass production purposes. The bonding force of FDM 3D printers tends to cause layer separation in the finished object. This compromises resolution and surface smoothness. In addition, when printing more detailed objects, the printing speed is drastically hampered. Selective laser melting (SLM), also commonly referred to as Direct Metal Laser Sintering (DMLS), uses a laser to fuse fine metal powders together layer by layer, resulting in high-quality metal objects. The process is very similar to that of SLS, with one of the only differences being that SLS is generally used for plastics, ceramics, glass and alloys while SLM is used for metals. This is because SLM achieves a full melt of pure metals into a homogenous while SLS only sinters, or fuses, the powders of metal alloys. SLM has a myriad of uses, including applications in the aerospace, construction and gas industries. SLM is especially useful in creating geometrically intricate objects, particularly ones with complicated inner layers. The process results in smooth, finished parts that require little post-processing. Moreover, the leftover powder is re-usable, minimizing waste and maximizing cost-efficiency. 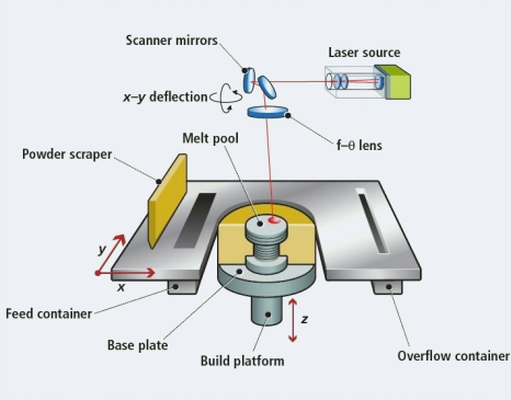 Electronic beam melting (EBM) is yet another example of an additive manufacturing technology. While EBM is not drastically different from selective laser melting, there are some differences in the quality of the finished product, which we will discuss later. 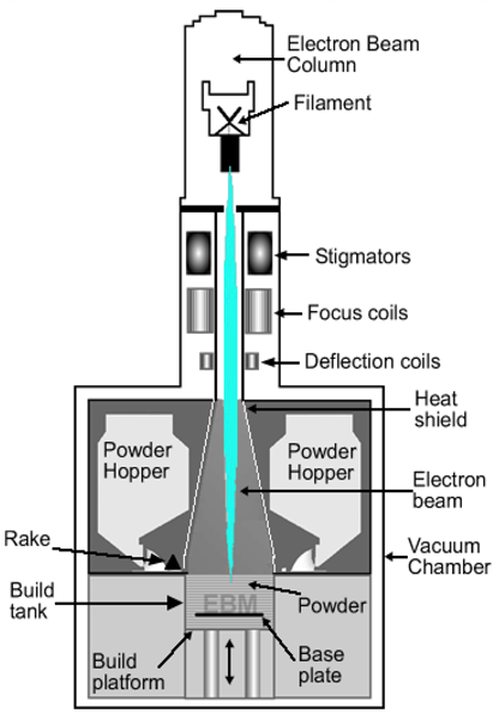 EBM uses an electron beam to selectively melt and meld metal powders according to the exact geometry defined by a CAD model. 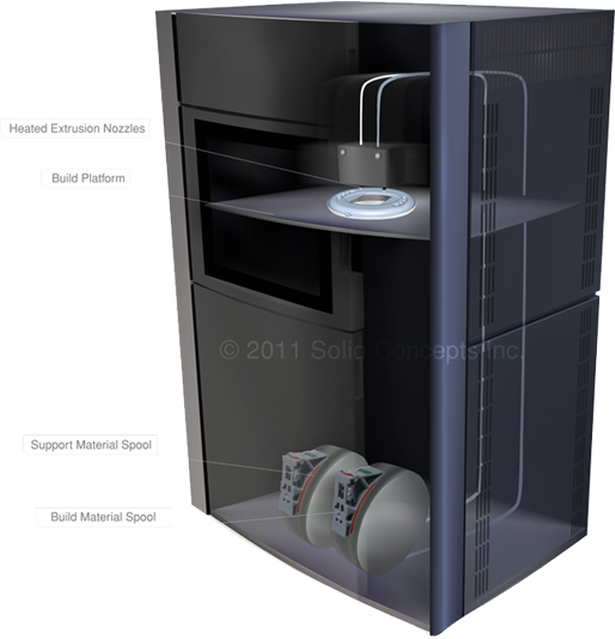 Like so, fully dense metal objects can be built, layer by layer, as the build platform descends. An excellent choice for rapid manufacturing and prototyping of metal objects, EBM typically uses titanium as the primary printing material due to its strength and lightweight properties. Like other additive manufacturing techniques, EBM can produce complex designs that are practically impossible to achieve with traditional casting methods. By eliminating the extra step of machining and casting, EBM decreases manufacturing costs assembly time. As such, EBM is often seen in the medical and aerospace industries, from custom orthopaedic implants to military aircraft and missiles. Electronic beam melting is compatible with significantly less types of metal. If cost restrictions do not allow for the use of titanium, aluminum or steel can be substituted. Furthermore, because the finished products are far less refined and polished than they would be with SLM, they require more post processing. Finally, EBM is still a relatively expensive technology. During laminated object manufacturing (LOM), layers of material (usually paper or plastic) are fused together, layer by layer, with an adhesive, heat and pressure. A computer-controlled laser then cuts the material into the shape defined by the CAD file. Once the object is complete, any excess material is cut away. Objects printed with paper look like wood and can be sanded or finished. To protect paper objects against moisture, sealing with paint or lacquer is recommended. LOM is one of the fastest ways to create scaled models and conceptual prototypes; as such, it is often a good, inexpensive choice for rapid prototyping. The materials used (paper and plastic) are much cheaper and more accessible than those used by other 3D-printing methods. Because accuracy is not a strength of LOM, the technology is not well suited for functional prototypes. Furthermore, it cannot be used to create hollow parts or highly intricate patterns. In essence, selective laser sintering (SLS) is a form of additive manufacturing that allows you to create solid objects from powders. SLS fuses fine particles of plastic, ceramic, metal or glass together layer by layer, using heat from a laser. Once each layer is complete, the platform descends and another layer of powder is fused to the growing structure. With its ability to print with a variety of high-quality materials, SLS can be used to create both prototypes and finished products, and it’s especially suitable for printing highly complex or delicate objects. As such, it’s a popular printing method for customized products like hearing aids, dental retainers and prosthetics. Objects created with SLS 3D printers require very little additional finishing (e.g. sanding) once they are printed. In addition, with SLS, no additional supports have to be used to hold the object together during the printing process, which means that SLS is a lot less time-consuming than other 3D-printing methods like SLA and FDM. 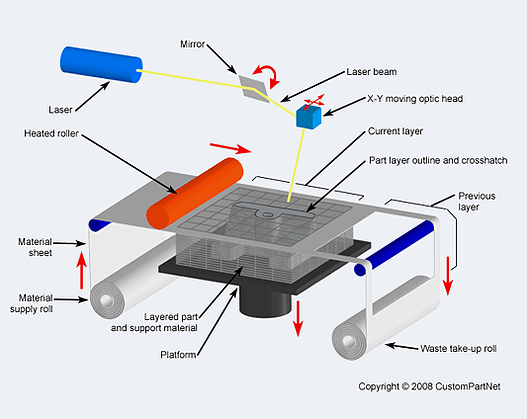 Multi-jet printing (MJP), or multi-jet modelling (MJM), works similarly to stereolithography except it uses UV light instead of lasers. Thermoplastic material is deposited one layer at a time onto the build platform in an inkjet-like process. Each layer is cured with UV light after it is jetted. Supports are sometimes used for overhanging features during the printing process; however, they are easily removed once the print is complete. Objects created with MJP technology have high resolution and good surface quality. This makes MJP a prime choice in creating high-quality prototypes for industrial and mechanical design, engineering, medical and dental applications, where precision is key. Parts are hard, durable, smooth and offer a high level of detail, especially when it comes to internal geometry. A number of finishing options are available. On top of that, MJP 3D printers are easier to maintain than SLA machines. Removing support material is simple, quick and allows even the most delicate features to be cleaned. The main criticism of MJP technology is that some of the materials may not hold up well over time. However, since this is still a fairly new technology, more research needs to be done.